DesignApplause | Fly swatter. Pascal charmolu. 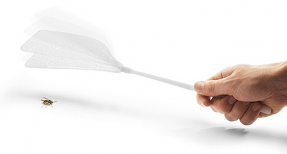 The Born in Sweden fly swatter is a new and futuristic take on the flay swatter. Inspired by the wings of an insect, the swatter has a dual swap surface for double the effectiveness of a typical swatter. it comes in several colors and is coming soon. Care instructions: Wipe clean with a damp cloth and mild detergent.